Jeremiah Burroughs was a 17th century Puritan minister, who is as little known today as the subject he deals with in this recently republished title. “Gospel Worship” is considered by some to be Burroughs greatest work. God alone determines the manner in which we ought to approach Him, a truth which needs to be rediscovered by much of the modern day church. 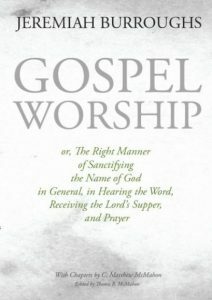 This work doesn’t deal specifically with the form of worship in relation to sung praise, rather with the hearing of the Word, receiving the Lord’s Supper and Prayer. Through 14 sermons, based upon on Nadab and Abihu’s deaths (Leviticus 10:1-3), Burroughs provides challenging insights into the right and the wrong way to worship God. He deals with questions which are seldom even asked today, such as, how ought we to prepare ourselves for worship and how ought we to sanctify God’s name in worship? This book ought to be read by every believer, and should to be required reading for any minister of the Gospel.